Why are we here? Where is here? Why are we doing this? Eve blinked her eyes open. It took the girl a moment to orient her dizzy senses, and she lay there in the darkness. Cold. It was the first sensation that hit her. Her back was cold, and the unpleasantness was slowly seeping through her being. She was sprawled out on some surface on her back, as her arms lay limply by her sides. She attempted flexing them and noted the success of her nervous system's reaction. She closed her eyes and inhaled deeply, before making a herculean effort to sit up. It was hard to breathe; she wheezed, but sat up. There was a change in her surroundings. When she had been laying down, it seemed light enough, but now she stared into an abyss of darkness. There was light above her - a source of fire. A flame. A candle. Not just one candle, but a series of them along the wall. Eve ventured forth to lean and touch the wall - it was rock. She wasn't alone - she could hear sounds of faint breathing around her. She staggered to her feet, rocks crunching noisily under her. A voice, unknown to the man who laid on what seems to be cold as ice, sort of smooth and rough, marble? The voice again, to this the man decided that he should, indeed, awaken. Deramoto finally sat up, he felt a slight numbness in his neck, as if it's been weeks since he's laid in a proper bed. "Ouch..." he groaned as he rubbed his neck, darkness surrounded him, except for a light. Deramoto stared at the light to try getting his eyes to adjust, once they did, he got up and started walking to it as seeing as there is no apparent threat in the general location. Anzan stirred from his somewhat comatose state to find himself in a strange room that would have been pitch black if not for the strategic placement of several candles. He tried to remember what happened, how he got there, where there was and where he came from. He heard a mysterious voice at that moment which just simply said "Awaken" once he heard it he snapped fully into consciousness hearing a few scraping footsteps and as he sat up he realized how uncomfortable he really was "How long have I been here? and what no pillow..." He paused blinking a few times, becoming confused by his sarcastic comment `wait what?` he thought `what's a pillow? where did that even come from` he thought it might be just a side-effect of whatever happened or something but some things seemed clearer than others, for example his name. Anzan slowly stood up, looking around and brushing off his prior confusion; he called out "Is anyone else in here?" immediately regretting it, as he wondered if the thing he could clearly hear breathing in here, was aggressive. The main reason being he was definitely not in a state to fight having only just came to. Seishin was nearby slumped against a wall. Coming to he immediately started to panic feeling himself protectively; checking that he was still in one piece and most importantly that he still had his gloves and scarf. He then breathed a sigh of relief before slowly panning his view up and looking around the room noticing candles periodically along the wall but not much else at least not in the darkness. He heard a strangely commanding voice "Awaken" which freaked him out pushing himself up against the wall and getting a sudden tinge of pain from his awkward 'sleeping' position then slowly and awkwardly standing up. His head flew round when he heard another voice making some odd statement about a 'pillow?' that caused him to think `What the hell is going on here and what's he going on about? Pillow?` he then heard the same voice somewhat confidently asking if anyone else was in the room. He was about to speak when suddenly a crippling fear came over him that he didn't know this guy or this place, for all he knew it could be his executioner however far-fetched that idea was. Taking a deep breath he quietly struck up the courage to say "Yeah, I'm... I'm here.." looking in the direction of the noise he asked "W.. Where are you? Who are you?" trying to adjust his eyes to the darkness readjusting his scarf and ensuring it was secure and comfortable. Anzan heard the reply and just stood paused he could sense the shared lack of confidence it the guys voice and said "I'm here" moving towards the voice and saying "I'm Anzan, are you alone?" in an attempt to put this other `stranger` at ease. Seishin replying "Yes I think" as Anzan came into view standing with him and informing him "I'm Seishin.. that's all I've got sorry" Anzan nodded moving to Seishin's side and scanning the room for any signs of movement. Awaiting for something to happen at least. Eve puzzled over the current predicament; she had no idea where she was, or how she got there. Kidnapping?! Her eyes darted to and fro, searching for hostile beings. It wasn't exactly encouraging that she couldn't see any farther than an arm's length from her. She sidled backwards, back against the freezing rock. By the sounds of it, other people were getting to their feet too - wait, other people? She wasn't alone? Her heart beat accelerated. Already conversations were being struck to her left - not too distant, by the sound of it. Two males. What was that they were saying...? Mere introductions with sharings of names? ...Names? Name...what was her name? The girl was silent for a minute before remembering. Yes, her name was Eve - what did she have, amnesia? She ran a hand through her hair, sighing lightly. This was no time to be thinking of such things. She inspected the corridors - they both petered away into darkness, but one side continued with a line of candles, and the other was ominously dark. She wondered, what lay concealed behind the shroud of darkness. "Huh...what? I'm awake, I'm awake..." Jonathon said, rather groggily as he sat up to rub his eyes. He stopped when he noticed a mark on the back of his hand that wasn't there before. "That...That wasn't there when I fell asleep...I didn't drink last night...It doesn't hurt like it's a new tattoo...or smell like sharpie." He looked around and realized he didn't know where he was. "Uh...hello? Anybody out there? Hello? I have no idea how I got here." He pulled himself up and looked around, seeing a few other people around the room. "Uh...Hi, do any of you know how we got here, and did any of you get tattoos, or just me?" He held up his hand to the others who all seemed to be in similar states of confusion. Deramoto heard conversation starting to stir up around him, but his thoughts were else where, as in he doesn't remember anything from before and it worries him a lot. He started to look around more and get ideas from his surroundings, which did calm him down a bit, as he now has something to fill the missing memory. "It seems darker on that side than on this side..." he mumbled to himself, "and there is people around as well, meaning I'm not alone." He looked around, seeing the shadows of people here and there, and what might possibly be the exit, which led him to wonder, should he tell his fellow visitors? If he does, how will they react? He didn't know them, or anyone in existence anymore to be honest, so... why should he? He stood there for a moment to think about it. Anzan picked up on something nearby, in fact multiple things; `were there more people?` he wondered. First there was a sigh to the pair's left and then a mumbling voice to their right sounded just as confused as they were he put together. It was then that a guy walked up to them and asked multiple questions; many of which the pair shared curiosity. "Um.. To be honest no I have no clue where we are but, figured we may be able to work it out together huh? Cause this is just straight up weird" Anzan remarked, he then heard a question about a.. tattoo? "Um.. Not that I'm aware man" they looked curiously at the guys hand. Seishin suddenly saying "Me neither... but, that is interesting... I mean now that I think about it.. I don't know where these, gloves and this..." he looked at the items of clothing "scarf came from but I just feel... a kind of connection like they're a part of me" showing them to the guys without taking them off as they too had markings on them but different to that of the stranger's. Thinking about it he didn't really remember anything but his name and that strange connection to the scarf and gloves; `what were they he wondered` Anzan looked between them and thought `So these two have got something weird going on.. with markings. But I don't know I feel fine... if only I could remember` Anzan then said "Oh yeah I'm Anzan, and he's Seishin that's all we remembered; How about you man?" genuinely wondering what else this guy might know. Seishin slowly started stepping away from the group towards the sound of mumbling which he could just make out was another guy, trying to piece things together in the shadows "E.. excuse me is anyone there?.. You're... you're not alone okay?.. Why don't you come stand with us and.. we can try to piece this craziness together" thinking it was safety in numbers and having a natural drive to want to help people, this being made easier by the fact he too knew what this guy was feeling at least he thought he did. Anzan looked across and noticed Seishin but was fine because he was still able to just see him and as long as he could he was fine; he listened in on the conversation and smiled `Why not. Typical of this guy to expand our numbers, I guess being together would be useful though, especially as I have No Idea how dangerous this weird place is` he then returned his attention to the tattoo guy. Seishin made his way back over leaving the choice down to the mumbling boy as to whether or not he wanted to come over after all why should this boy trust them, he didn't know them and he was probably just as scared or at least it was likely, what sort of nut-job wouldn't be in this situation; even if they didn't exactly know what the `situation` was per se. Eve slid to the floor, back still pressed to the wall. Conversations had begun springing up around her, and acquaintances were already made. Herself, she just wanted to leave. She really did not wish to stay here in the stifling darkness any longer. Everybody else was free to stand around and assess the situation - which she would grudgingly admit was a smart thing to do - she was walking alone. Getting up with a clearer head this time, she walked further down the candle-lit hallway. "W-Wait! I'm coming with you!" Someone piped from behind her. She stopped walking and turned around, and could hear rapid footsteps coming closer. Stifling the urge to run, she held her ground for a moment then continued walking. The footsteps slowed and fell into an uneasy rhythm some ways back. "...Huh? I...don't remember anything." This last whisper was by Eve herself. As she was surrounded by voices as she traversed on, she retreated to her own thoughts to clear things out. Someone loudly proclaimed, "I'm heading down this way." He - for it was the deep voice of a male - was clearly trying to be confident, but his voice wavered slightly. Still, the support of a decision finally made gave several the incentive to follow him. "Hey, hey. There's a way this way too, you know, this way too." Somebody seemed to be repeating things twice in their nervousness, a slightly higher pitched voice, and it was quite loud, for Eve passed by just as the person spoke. "Feel free to go that way." Eve quietly retorted, passing through into the darkness again. Each had not seen the other, had only heard their voices; she was sure of that. After what seemed to be an eternity of walking, she finally stumbled over something, throwing her hands up to protect herself. Instead, they contacted a wall - an actual wall, made of some stone that was smooth and cool to the touch. She leaned against it, drawing herself up, and noted the stairway travelling upwards. It was a thin way snaking itself towards light - sunlight? The stairway had even stairs, which a person had clearly crafted - unlike the rest of the rugged walls - and was thin enough only for one person to travel at a time. The ceiling of it dipped and curved, making it necessary to crawl in some places, but it did not seem impassable. To Eve, it seemed the only way out, but she hesitated. At the end of it, which reality would she face? Deramoto was thinking when he heard a voice call out to someone else, it sounded as if it were towards him, but it sounded as if the other wasn't sure there was anyone else in this general direction. This gave him time to think of what to do, tell him of his presence, or try to hide from the other male. If he told him, that means he would have to trust the guy, but if he hid, then he would have to try his best to avoid him, which wasn't all that hard in the dark. He started to hear more voices spring to life, and he started to realize that the other male was possibly coming closer to him, so he started to back up. He then realized why the other male might have come to him, the sound of him talking to himself, and now with others talking, he could avoid him and hope that the other might think he either moved, or was from a different direction. With this new thought in his mind, he started to back away from the one calling out to him, going more into the shadows. "Does anyone know" commented someone from somewhat of a distance to some, and somewhat close to others. The voice was fairly deep, and slightly demanding as well. He looked around for anyone nearby, but only sound told him of distances. After a while of waiting, he called out again "Hello? Is there anyone out there that knows what's going on?" he sounded a little more irritated. "Hey, hey. There's a way this way too, you know, this way too." called out a higher pitched voice, with her repeating things twice showed she was surely nervous. She heard someone quietly say to head that way "Ok, ok... I will, I guess I will" her voice started to quiver. She started to walk in the general direction of the exit. "Great, just me then." He said, staring at the mark on his hand and sighing. "I need to get out of here." He muttered, standing up, finding it surprisingly tiring. Taking a second to balance himself he let out a sigh as he took in his surroundings and made his way to the exit before feeling a cold steel grip on his shoulder. "Uh...oh..."
"Where do you think you're going?" A voice that didn't fit the hand on his shoulder said, Jonathon turned to see a large armored figure with a shorter figure clad in black with their face covered. "Well, where do you think you're going, huh?" The short figure asked, pulling out a dagger and pointing it at the confused Jonathon. "I was trying to get out of here..." He said, concerned by the intentions of the two. "Good, cause so do we, come on." The armored figure grabbed Jonathon and dragged him as the three made their exit. Anzan and Seishin looked as Jonathon started to walk off and Anzan noticed the man clad in armor who'd sneaked up on him, he then overhead the conversation and moved towards them asking "Hey man are you alright? Are these guys bothering you?" looking at them confidently not just willing to let them take him in the manner in which they were; especially when the bigger jackass grabbed him "Why don't you leave him alone huh? Let this decision be his instead of being a forceful moron? Maybe even try asking first you know" stepping towards them though Seishin stepped back not being much help in conflict and especially not in his current state, he wondered where the sudden energy Anzan received came from. Seishin overheard multiple people remarking about varying different exits and to be perfectly honest had no idea which one to take. He panned his view round to the arguing and said "Can.. Can we just all calm down and work together?.. It seems most logical for the group rather than this arguing" he then heard of some stairs and saw the light thinking `this has to be our best shot seems most logical` he then said to Anzan and the other trio "I see some light we should probably check it out would you join me?" Anzan looked round and nodded calming down a bit but keeping an eye on the other pair just in case they tried anything funny. Another pair stepped from the shadows they appeared older and must've been at least 22 proving that there were people of at least around that age here as well this just caused curiosity as to how old the people here went. "Excuse me for interrupting" the short male with red hair piped up "But could we join you guys?... you know in looking for a way out?... It's fine if you say no" the slender female with long dark blue hair that had purple streaks then put a hand on his shoulder and said "Okay what he meant to say is, we're joining you guys after all can't exactly say no; Daikan here's just a little bit nervy around people dunno why though, and I'm Ryuko that's all we know" Daikan shuffled about a bit on the spot clearly becoming anxious of rejection which Ryuko clearly wasn't going to accept. Anzan shrugged becoming confused by this busyness and Seishin was starting to overthink the sheer numbers here he usually had a clear mind but that was particularly difficult when so much was happening. Anzan said "Why not strength in numbers" the now escape group of four thus far standing together and looking at Jonathon and the rugged pair waiting for their next move. While Eve hesitated, she was joined by a sizeable group, all looking to seek the light. Finally a man decided to take the initiative and squeezed through. Due to his broad build, it was a bit of a struggle for him, but he managed. Eve decided that the girls would have an easier time here due to their slighter builds. She positioned herself next in line due to everybody's natural hesitation to take a leap of faith. Keeping a hand along the wall, she started climbing. It was, she admitted, a long climb. Her legs were staggering by the time she reached the peak, but she'd never been that athletic to begin with. She had to lean against the doorway for a moment to take a breath, and in doing so, roved the area. In font of her stretched fields of greenery, and in the background rose a town, that bore the appearance of a castle. Her shoulder was brushed by an older woman, who looked around the mid-twenties, with long platinum blonde hair. She made to snap at Eve, but was stopped short by the new scene before her. Eve shut her eyes and turned her face upwards, only to be greeted by a bright crimson moon upon opening them again. A red moon? That was...unnatural. And yet she couldn't remember why. "Whoa, watch who you're talking to!" The shorter, and younger, of the pair that had encountered Jonathon said to Anzan. "We were just scoping this place out when we stumbled across your body here. Muarim and I just wanted to make sure that he wasn't going to try anything. Let him go big guy!" The kid waved a hand and the armored man released their hand from Jonathon's shoulder and nodded as an apology to which Jonathon awkwardly chuckled. "Now, unless you folks want to stay down here, you can. However, if you do want to leave, we know a way out of here, just like we were telling your friend here." The kid motioned back to Jonathon. "So, who wants to get out?" Deramoto has seemed to successfully avoid the situation entirely, with that he sighed. He looked around for the exit he seen earlier, and started to head in that direction while staying within the shadows. To his luck, he reached it without having to worry of anyone else, except for the ones outside, which made him question again if he should stay or go out. He decided, in the end, to stay and watch the people to get a general idea of everyone. The irritated man has now become annoyed, all this conversation and no one is even considering answering his questions. He decided to give up on the situation and started to head in everyone nearby's general direction. The nervous girl was following Eve, and she seemed to have calmed a little bit "I can't wait to reach the outside... then I won't have to worry about people attacking me anymore..." she said towards Eve, but it was more intended for herself. She then realize that she wasn't talking to the same person as before, she was now talking to a wall, and how she ended up going the wrong way is unknown to her, and quite worrying, she began to feel even more fear, and was muttering nonsense to herself in hopes of calming herself down. Two new people has joined the group, a male and female, the female is younger and seems very stressed out, but relieved when she exits the building they were all in, the male looked to be the one trying to comfort the female when she needs it. "Stellara and Joridno (Stel-lair-ah / Jor-id-no (Stellar and Stella, Joridno was more random XD))" Deramoto whispered to himself, those were the names he heard from the two, he's heard some of the others name as well, a few inside the building, and few outside as well. With him sitting there he is also noticing how some people act towards others, one girl bumps into another girl and almost get's mad, while the other seems to be in a trance by something in the sky. Anzan calmed down and mockingly said "Pfft watch who you're talking to" then as the smaller guy, got his friend to let Jonathon go he continued "More like it just remember we're all in the same situation here so it's better to work together than start fights, now first lets see what Seishin spotted after all I think I heard a lot of people over there too and Seishin seems to know what he's doing" indicating into the darkness in the direction of the stairs people were using to escape feeling as though staying with a group was probably the best; and safest; idea. Seishin breathed a sigh of relief that the arguing was over, not particularly a fan of conflict, he then went on to say "Thank you Anzan let's check it out" Daikan and Ryuko nodding in agreement. Anzan looked to Jonathon and said "I know these guys claim to have found another exit but they don't exactly seem the most stable pair right? Anyway it's up to you if you wanna tag along with us and check out those stairs we heard about or go with them" He shot them a look and continued still visibly annoyed at their earlier actions "Now that you don't have dagger on you" he turned to Seishin smiling and confidently said "Why don't you lead the way man" Seishin nodding "Oh.. um.. Okay then I guess this way" somewhat thrown off by leading their group even for a short amount of time even if he was the one to have heard about the stairs, being particularly perceptive. Seishin stepped into the darkness in the direction of the other voices and footsteps which seemed to be echoing further away higher determining that it must be where the stairs were, Daikan and Ryuko being next to follow and then Anzan still shooting Muarim and Tormod looks as if to say `try anything again and you'll regret it`. Moments into the darkness Seishin felt his ankle strike something, discovering it to be the first step, the others must have already gone ahead. He then turned and informed the others "Here they are guys" obviously referring to the aforementioned stairs, Daikan, Ryuko and Anzan all extremely close behind as to not be lost in the darkness. Anzan replied "Then by all means lead the way man we trust you" Ryuko piping up "Agreed isn't that right Daikan?" Daikan looking up from his feet and saying "Oh.. um.. yes that is" clearly still nervous around the group, Ryuko put a friendly hand on his shoulder and laughed slightly in a friendly reassuring sort of way that she had with him. Seishin began up the stairs feeling his way along the long climb for safety purposes; closely followed by the others. After getting through the sections of the climb eventually reaching the top Seishin shielded his eyes with his arm and said "We've made it guys and it's bright up here, oh and be careful of the last step" exiting the darkness of the stairs into an area which appeared filled with all sorts of people of all shapes and sizes, but the thing that caught all of their attention was the mysterious bright crimson moon it seemed so strange and yet they didn't know why as they had no memory of anything different. The group looked around wondering what was going to happen next now that they'd all managed to get out of the creepy dark and dimly lit room. Eve tilted her head to face backwards, towards the entrance of the stairs. More people were emerging, evidently already acquainted fairly well. 12. There were twelve people, including her. She ran a hand through her hair; were all of them like her? She paused. What did she mean by 'like her'? What was it about her? A gruff clank got her attention. That's when she noticed a couple of men in...armour? They carried spears, and their suit of metal seemed heavy. Who were they? "Is everyone here?" One man enquired. Both looked voluminous under their armour, and Eve, preoccupied with her thoughts, took a moment to realize they were talking to her. "...Er, I think so." She carefully hedged. "Right. Move it. Move it, people!" The last line was shouted out for all to hear. Then one headed towards the road, for there was indeed a dirt road winding off into the distance, towards the 'city'. The other waited for all to move ahead; he would bring up the rear. "Uh oh, we've been made!" The kid shouted as the actually guards moved in. One grabbed him and confiscated his weapon while the big guy put his hands up in surrender. "Oh come on Muarim, we can take these guys!" The short one said, before eventually just sighing and admitting defeat. "Uh...where are you taking us?" Jonathon asked, not exactly sure if he trusted these guys. The guard just pointed and Jonathon sighed, clearly this wasn't going to work. He looked at the rest of the people in the room and shrugged before starting to follow the first guard along. Muarim picked up the kid and started to carry him down the tunnel as well. Another group walked into the crowd, and all that was left out, was him evidently. Two guards has entered the scene and two seemed to have been... admitting defeat? What seems to be the biggest thing is that all of them seem to be leaving without, which he feels like he normally wouldn't care, but he isn't sure what is going on, so his best option was to get out with no one noticing and follow them, probably even try sneaking into the crowd somehow without anyone realizing there is new member. He wasn't sure that this would work though, but it'd never hurt to try atleast. He started to crawl up the stairs and when he almost reached the exit, he looked out into the open and noticed everyone was already heading on out. Facing away from him he thought, that he could possibly just start out now walking quickly, because they would probably notice as they seem more focused on where they are going. He exited the building and started walking quickly, making his way to the people quickly and quietly as he can. Anzan, Seishin, Daikan and Ryuko all walked along with the group talking quietly "Where'd you think they're taking us? Can't say the armor and spears are too reassuring" Anzan started, Ryuko quickly cut in "I have no idea but I think even with their weapons if anything bad were to happen we easily out number them six to one each" Anzan nodded seemingly accepting of that idea. Seishin then spoke up "I believe.. if I may.. that we may be going to that city up ahead perhaps" Daikan nodded as well "That.. that would appear.. logical" Ryuko laughed "Aww Daikan's starting to open up to you guys isn't that sweet" she said teasingly causing Daikan to blush slightly. Anzan noticed a few people who stood out from the rest of the group, for varying reasons and looking around it was obvious that everyone had their own unique.. quirks in fact his clothes compared to others were part stand-offish and the scarf and gloves Seishin was wearing despite the current somewhat okay weather. The tall imposing female with them and her long hair which Anzan couldn't get his head around how it could possibly be useful in a fight or her slight shorter red headed somewhat soft friend. The group all continued to look around pondering the purpose of their being there in this weird world, of where they came from but no-one could remember anything no matter how hard they tried. Anzan clenched his fist tightly clearly annoyed at his memory's failings and he judged by the others faces that they were drawing up about the same amount as him. He looked to the guard dropping back from his friends and said to the tall imposing titan of a man "Hey big guy mind explaining for us what the heck we're doing here? Or or.. hear me out for a second here.. where we're going per chance?" using exaggerated hand movements sarcastically "It's not like I'm asking a lot man?" shrugging to him but ensuring he kept enough distance smartly that should anything.. let's say... aggressive, happen everyone would know. One of the guys in armour faced back to the question. "We're going to the headquarters," He stated briefly. Neither of the group may have noticed yet, but Eve was walking silently behind the two men, having gradually worked her way from the back of the crowd. Patience wasn't her best virtue, but she knew when to be discriminating. 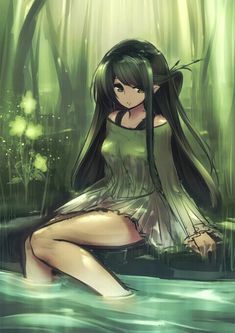 She carefully placed her feet to maintain a steady pace and a steadier silence, with the only sound surrounding her being the quiet rustling of clothes. "This is where we leave you." One man gruffly said, swinging a door open. Eve, lost in her thoughts, had not noticed that they passed through a town with houses made of bricks. It seemed like something out of a picture - due to it being the early hours of the day, with the sun just rising, the townspeople were probably stirring in their beds now; the roads were paved with bricks while stalls and closed shops lined the streets on either way. Delicious smells wafted around from an occasional open shop. The girl turned to glance at the sun rising, the light reflecting into her dark eyes to reveal their true shade of brown. "In." The men ushered the people in and shut the door after them. The tension seemed to heighten inside the room, for in front of them was a table, and a chair, both claimed by an individual who sat staring at them. The person leaned forward, placed his elbows on the counter, and rested his chin atop folded fingers. One might notice he had a cleft chin. Enough about that though, it was his hair color. Pink. And that maybe he had lipstick on, but the color of his lips were black. That he had long, bushy eyebrows encircling blue eyes… a gorgeous sky-blue, which made them remarkably frightening. That his face was covered very heavily with makeup and his cheekbones were highlighted with bright red blush. But no matter how anyone looked at him, he was definitely a man. Deramoto hadn't reached the crowd until the they all reached the town, and even still he kept a few feet back. Soon they all reached a building and went inside, he was the last to enter and decided to be the one to close the door behind him. He sat against the wall and decided to simply listen to what everyone had to say, since he didn't have that much of a clue. Crimson Moon? He wondered about the name for a second, could it mean that they are a murderous group that works during the night, it was night out now and a guard had brought them all here, he was unsure, so he waited to see what would happen. "Listen hear lady! We aren't gonna get roped into no army! We were just...er...looking around the place!" The kid said as the woman finished her explanation. "Tormod, it is useless to try to oppose these people, just stop." The large, still armored, man spoke. "We are now in the same group as the rest now, we were caught in our attempts at thievery." One of the guards scoffed at that. "I apologize for that milady, we wound up stealing noting." Muarim said, then glared at Tormod who grumbled and crossed his arms. "Um, if I may. What exactly are we doing here commander? Have we done something wrong to wind up here, also, were you the one responsible for this?" He held up the back of his hand, showing the strange new brand that was now there to her. Brittany's eyes narrowed, and before any of the 12 could blink, he was at the kid's throat, holding onto the front of his shirt to pull him closer, a dagger pressed into his neck. "No one has ever called me a woman and got away with it, with their lives." He searched the kid's face. "Still, you're kinda cute." He didn't release his grip on the kid's shirt, though he lowered the dagger. It was not to be questioned that he could easily cut anyone down in the room. He turned his attention to the big guy. "You, why do you have armour? What robbery are you talking about?" Brittany looked perplexed. "You're different from the rest of the group. And I'm not a woman, get it?" He called for some guards who immediately stripped Tormod of his 'armour'; it was unnatural that he should have it. "And for those of you who oppose the army; this is the only paying job. The alternative is becoming someone's slave - you'd barely scratch out a living." Bri scoffed. "Unless, of course, you'd rather become my private pet." He practically purred it out, and it sent shivers up Eve's spine. There were murmurs among the group now, with decisions being made. Brittany released the child and retreated to his desk, displaying 12 pouches. "These here have 10 silver each, the currency of Grimgar. Joining will earn you one of these. Of course, you start out as trainees. While the regular army fights at the forefront, you, the trainees, or volunteers," He grinned, "will be responsible for protecting the town by exterminating the monsters around the town. You will gather the spoils and sell them for money. It's not an easy job." He pointed his finger at all present. "You all will die." He shrugged, "Well, it is at least a possibility." He glared at the group. "Any questions? Hurry up, I'm a busy man." Anzan liked the fact the guard had at least the respect to answer him even if was only a half answer though the other half came when they entered a room with an odd-looking individual that had pink hair and to be honest he believed looked quite feminine. Seishin looked to him when they were all in the room visibly confused as they listened to the one now known as Brittany explaining things using words like commanding officer and army indicating some sort of.. war; but against what? This caused Anzan and Seishin to both get equally annoyed as they considered the fact there was a war and wondered why the hell neither of them seemed to remember something this big; it's not exactly something you'd forget quickly. Anzan noticed a young man enter quietly and sit near the back starting to think it was a good idea but alas too late now, he then couldn't help but hear that idiot from before, the one with a dagger who he had to put in his place. `What do ya know` Anzan thought `this idiot's still trying to play the big man` and laughed probably louder than he should have when Brittany moved to him and managed to demonstrate his power. The larger one now known to be Muarim he thought was actually not that bad a guy just happened to be hooked up with the wrong person unfortunately for him and Anzan and Seishin couldn't help but feel a little bad for him when his armour was taken. Anzan, Seishin, Daikan and Ryuko then listened to options put forwards to them by Brittany considering it carefully but each of them shivered when Brittany mentioned having them as a `pet` sick weirdo Anzan thought. When Brittany finally released Tormod he thought that he must've gotten his point across sufficiently and looked to money heard the words 'Currency of Grimgar' this brought about even more confusion `Grimgar` Anzan thought `Where the hell is Grimgar? and what are these monsters he's talking about` he realized that it was more courtesy the offer though there was plenty of muscle put behind it. Anzan and Ryuko quickly decided that if it was the only way then they'd be joining the army though the usually passive Seishin and Daikan both took longer only agreeing once they figured that it was better than being slaves. Anzan the speaker for the group for some reason then spoke up "Yeah I've got some questions before we join up Brit" deliberately not using one of the prior mentioned names "Where the hell did we come from? What war? and here's the most important one that; I'm guessing we're all thinking" he remarked looking around the room "Why the hell can none of us remember anything?" standing confidently but not aggressively more inquisitively and watching determined to get his answers one way or another, Seishin, Daikan and Ryuko all nodding in total agreement at the questions Anzan put forward. Brittany listened somewhat impatiently to Anzan's questions, with a somewhat questionable look on his face. The look was a combination of 'why are you even asking this' and 'don't you know anything', which was probably difficult to pull off, but he did it. He sighed, and rested his head on his hands. "Alright, look. As you probably know, this place is called Grimgar." He pulled up a map; he seemed to have been expecting the questions. "This is where we are," He pointed to a small town-like area on the map, "This here is Altana, our line of defense, a fort we currently possess," Having put the odd stress on 'currently', he moved on, "South of Altana are these mountain passes called the Tenryuu Mountains- Why am I giving you a geography lesson?! Look, Grimgar is fighting a war against hostile races, and the forefront army is dispatched to fight it." Brittany looked Anzan up and down. "You new volunteers are always weird, huh? How am I supposed to know where you came from or what you can remember and what you can't?" Despite his words, he smirked unsettlingly. "You." He evidently pointed randomly, though unfortunately his finger settled on Eve. The girl seemed hesitant but stepped forward. "Relax, sweetie. Here, best history book of the continent." Simply to save himself the trouble, Bri tossed a large, dusty book at her. It thudded to the table, and sent up a cloud of dust, causing Eve to take a step back; it was suffocating enough in the room without that. She leafed through quickly and began reading out loud as though it came naturally to her, "South of Altana lay a series of tall, precipitous mountains known as the Tenryuu Mountain Range. The Tenryuu Mountains divided the Grimgal continent into two parts. The southern part was considered the mainland while the northern area, including Altana, was known as the frontier. Or at least “frontier” was what the humans called it. The main continent, Altana, and the frontier territories, north of the Tenryuu Mountains, were in the possession of the human Aravakia Kingdom. However, until about one hundred fifty years ago, the frontier hadn’t been a frontier at all. In the past, there existed several human kingdoms, and humans were the predominant race of Grimgal. However, everything had changed with the arrival of the fearsome, demonic-magic wielding Deathless King. He did not just possess military and magical might, but was a skilled politician as well. The Deathless King brought forth a new race of undead and, as their leader, did more than merely conquer. He convinced the leaders of other races to acknowledge his authority, formed a confederation of kings with them, and subsequently went to war with the human kingdoms. The humans were easily defeated and forced to flee south of the Tenryuu Mountains. Afterwards, the Deathless King was nominated by his fellow kings to become the emperor and thus the Undying Empire was born. Until the death of the Deathless King about one hundred years ago, humans were largely unable to set foot north of the Tenryuu Mountains, but with the loss of his unifying leadership the Undying Empire fell apart. Taking advantage of the opportunity, the Aravakia Kingdom established Altana as their stronghold in the north and so it has remained to this day." She wondered if reading had been something she enjoyed previously, but the book was ripped out of her grasp. "Now, enough. You bore me. But not bad, cutie." Eve stifled a shudder and hastily retreated to the back, standing by Anzan. "So, I hope you enjoyed the history lesson. Now make your choice already! Goodness, I never had such a batch of Volunteers." Brittany huffed in exasperation. The trance was broken by one male stepping forward and picking up a pouch. "Oh?" Brittany smirked. "Not bad," He leaned closer, "I'll treat you good." With a muffled cry, the man quickly exited. The group visibly edged back, but a girl swallowed, mustered her courage and picked up her pouch. Brittany grinned. "Come on, now. Don't be shy!" Slowly, the 11 remaining were filtering forth to prepare for leaving, if only to prevent remaining in the same room as Brittany any longer.